I’ve recently had a couple of friends who have tried the low carb approach and they are surprised that how fast the weight comes off. Then the next moment I see them eating a carb laden meal or snack. I’ve learned not to react because unlike me, they all have normal pancreatic function and won’t suffer greatly from the depredation. But I understand. When I first divulged that I was on a very low carb diet, my endocrinologist’s comment was that it was “unsustainable”. I’m not gloating but it’s been 3 years and while I still do battle with carb cravings, it has been doable and a relatively happy ride for me. Some time ago I came across the idea of a 100% rule. The basic premise is that it is easier to keep to a behavior or action 100% and harder to do things 99% as it takes a huge amount of effort to do something consistently when one is not wholeheartedly committed to it. So there are 3 disparate things I am committed to in my life, but they cater to some of my basic needs in life. When I was diagnosed with insulin-dependent diabetes 3 years ago, I knew instinctively that my lifestyle and eating style had to change. 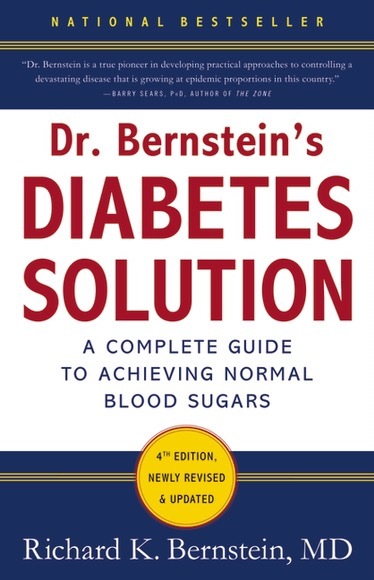 I’m grateful that in the bewilderment of trying to figure out how to care for myself, I stumbled across Dr Richard Bernstein’s website and book “The Diabetes Solution”. This lifestyle is based on the simple premise that carbohydrates are not an essential macronutrient and diabetics who deserve normal sugars and a complication free life can manage their disease by cutting down carbohydrates and therefore cutting their insulin needs. It works. I’m eternally grateful that I can manage my condition; I don’t have wild swings of glucose that is expected on a regular diet and there is a steadiness and predictability in my life. Interestingly I have found that it does take GRIT to maintain this lifestyle; my family has been tremendously supportive on this, and that’s where the 100% rule comes in – it is easier to stick to it 100% than 99%. That is to say that I haven’t deviated. I’ve tried to “cheat” a bit – a handful of fries or a couple more squares of chocolate – it is really strange but the spikes in glucose are not worth it because it seems to cause more insulin resistance and increased insulin requirements for a few days before things settle down again. So I’ve learned the hard way that my body prefers the 100% low carb way. This was a strange commitment that I didn’t see myself committing to until I was into it. I’ve always loved food and the making and baking of it. I didn’t start off a good cook and my forays into cooking came about because of living overseas and needing to recreate the tastes of home. As years went on, I remember somehow I always had the thought about writing a cookbook or compiling great recipes. Then the diabetes came and I switched my way of eating and cooking completely. I always thought it would be great to have a food blog, but I think I never committed to it until one day the thought came to me that I shouldn’t wait to do the things that I wanted to do and that I should live in the now. So despite my busyness I got into a regular rhythm of deliberately cooking or baking something new every week and blogging about it. At the beginning I think I was driven to blog slightly desperately in an attempt to see my stats rise, but after a while the blog took off and it’s in a cruise mode at the moment, and I hope it’s helping some folks out there to discover a better way of eating and living. I’ve been busy all my life. I think as a student I was pretty committed to extracurricular school activities and later as a doctor, 70-80 hour work weeks were the norm. But over time I discovered through illnesses brought on by abject exhaustion that I had to create stops in my life to recalibrate my thinking as well as to rest. So I do spend a half day a week away of personal time every week. This is usually a morning when I go to the park with bible and journal and spend time listening to God and thinking through what has been happening in my life. Once a year, I also do take an extended retreat to spend a few days in quiet contemplation, usually some time in the last quarter of the year. This came about because 3 years ago, I had a major surgery that enforced bed rest for about a month, then 2 years ago I broke my ankle and had to rest a couple of weeks. By the last year I got the message – if God has to keep putting stops in your life to slow you down, it is much better and less painful for you to create those deliberate stops for yourself than to keep hitting the wall. What do these stops do for me? These are moments of reflection and honest reckoning for me. Times when I take a peek at the emotional detritus that I’ve swept under a mental carpet. This has allowed me to deal with the churning within, when life is unfair or too demanding or draining. It gives me the emotional ballast to go on. So these 3 commitments seem very disparate but all seem to act in concert to stabilize my life on many fronts. The diet brings me health, the blogging feeds the creative need in me and the timeout gives me space for my soul. These things allow me to do what I do in my work – making tough decision, communicating with families and individuals, managing the many needs that come my way. The 100% rule does work – kid#1 just got his A level results and we were gobsmacked because he did much better than we expected. Either the school has been marking him down the whole of his school life so that Ds, Es and Us are the norm, or he suddenly woke up and studied. But to be fair, I see that he did 100% commit to his studies for the most of the past year. But he did also give us many heart stopping moments, like when he asked to do a gap year (what do you mean, a gap year before a major national exam???) or the many times he stayed out late and it was not clear if he was studying, dancing or doing graffiti art. Whatever it is we are grateful that he did well enough that we are assured that he can pursue a course in a local university. Back to my 100% rule regarding low carb lifestyle; it is really important to have low carb snack alternatives. I think I am intrinsically a snacker. It helps to have a couple of alternatives. 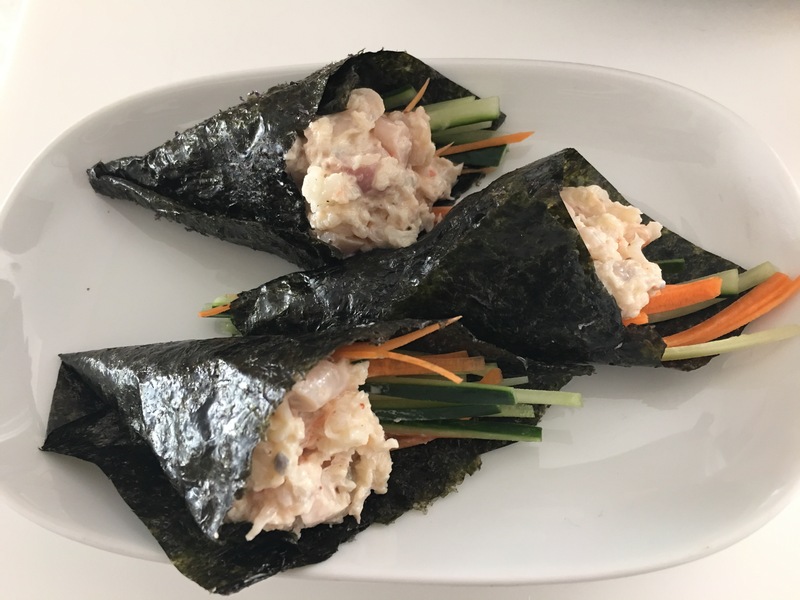 Out of convenience I often have a bit of cheese or nuts or maybe some leftovers from the fridge, but this spicy prawn hand roll is a great snack to share with company and terribly satisfying. The 100% rule allows me to have fun in the middle of the commitment! Julienne the cucumber and carrot; don’t use the seeded core of the cucumber as this is more wet and soggy. Mix the prawns, mayo, mustard, pepper, and red pepper flakes. Add salt to taste. Lay out the seaweed sheet on a flat surface. Spoon 2-3 heaped tablespoons of the prawn mix about 1/3 away from one side of the seaweed together with a small bunch of julienned cucumber and carrots. Carefully roll up the hand roll so that it looks like a cone. Serve immediately because the seaweed sheet gets soggy with the filling really quickly. =) i love to use greek yogurt in replacement of mayo nowadays! This looks good and easy to make. Thanku for the recipe! Yes that would work too! You can also make low carb mayo.